The boats are under construction and Hornblower Niagara Cruises is already looking for people to hire for their first season of operation in 2014. From their temporary office on St. Clair Ave., in downtown Niagara Falls, Madalena Phillips and Maria Melo are busy working behind the scenes putting systems in place so that things will run smoothly when their company begins to ferry passengers in the lower Niagara River to the base of the Horseshoe Falls. Work is underway to restore the Hotel Niagara in Niagara Falls, NY. The project has gotten some press lately. Now a report in this week’s Business First takes an in-depth look. Developer Harry Stinson is tackling the $24 million renovation. Some say it is a major piece of rebuilding downtown Niagara Falls. State Sen. George Maziarz, R-Newfane, believes the former site of a now-defunct helium balloon ride in downtown Niagara Falls would make the ideal spot for a proposed attraction involving Nik Wallenda. There is at least one potential hang up with his plan: The site, located at 310 Rainbow Blvd., is already being eyed by a Buffalo development company as a possible location for a new hotel and mixed-use building. Maziarz, who played an active role in helping Wallenda obtain the clearances needed for his June 15 walk across Niagara Falls, said this week he believes the property, often referred to as parcel 4, would be the ideal spot for what has been described as Wallenda’s “temporary” entertainment center on the American side. If the building’s owner has his way, an historic hotel that has languished for years in downtown Niagara Falls will be reopened by next summer. Hamilton, Ont., developer Harry Stinson said Monday design work on his plan for a new-look Hotel Niagara is nearly completed and he’s expecting interior demolition to begin on site next month. While thousands of eager shoppers will be running through department stores and retail outlets Thanksgiving night and early Black Friday, the man behind the new Holiday Market in downtown Niagara Falls is encouraging his customers to take it easy, avoid the rush and get down to Old Falls Street whenever they feel good and ready. The Falls version of a winter wonderland officially opens at noon on Friday. Billed as an American take on outdoor markets traditionally found in Europe, the Falls market will feature a mix of retail offerings, live performances and holiday activities. With the beginning of a new tourist season only a few months away, the owners of One Niagara plan to begin sprucing up the property as soon as next week. The building is in one of downtown’s most prominent locations. “We’re going to swing into operation right away; we’re ready to go now,” Niagara One President Tony Farina said Thursday. The city Planning Board approved a site plan for the property during a meeting Wednesday evening. “This is a good sign for the city. 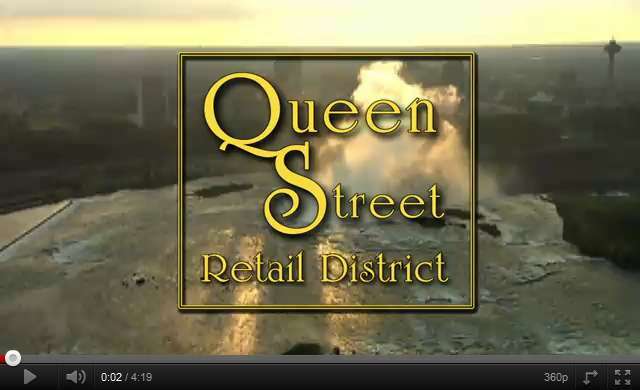 It’s very exciting, and it opens up a spark of hope for downtown Niagara Falls,” Farina said. More than a dozen new trees were planted along the Olympic Torch Run Legacy Trail in downtown Niagara Falls Friday, as part of Niagara Casinos’ green initiative. The first of the 14 trees was planted by Dave Brown, engineering shift manager with Niagara Casinos, who received the company’s first Green Leader Award for adopting environmental practices.